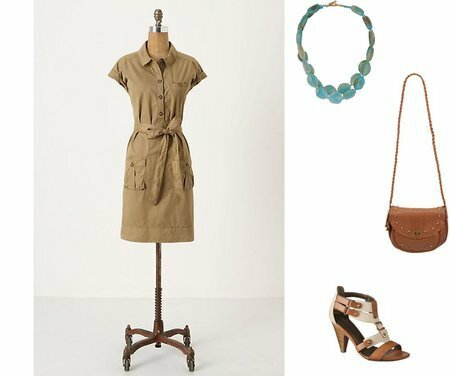 Lauren recently purchased Anthropologie's Days of Expedition shirt dress and was wondering if I could give her some accessories/shoe suggestions for work and weekend. She only spent $50 on the dress, so she doesn't want to spend more than that on accessories. Here are the outfit ideas I sent her - click on any image for more information. 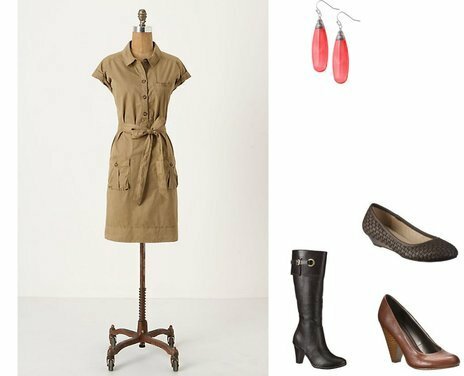 This first look is what I suggested for work - I wasn't sure what Lauren preferred, so I chose three work friendly shoes: boots, wedges, and heels. I paired the dress with some colorful coral (big for spring!) earrings and Lauren also mentioned that the tie is removable so I suggested perhaps wearing a more structured belt (see widget for some cute options). The next look is more for weekend - brunch, shopping, etc. If you prefer, you could change out the heeled sandals above for flat sandals, flats, or a strappy wedge (or a different heeled sandal). You could also add some different jewelry, here are some earrings that I thought would look cute. i just bought this dress! i'm so glad you posted this to see other options! thank you! !